Born and raised in Laredo, Texas, Jose "Pepe" Salinas has dedicated his life to serving the people of Webb County. Salinas graduated from St. Joseph's Academy and later obtained a Bachelor Degree in Business Administration. In 1979, he entered the law enforcement field where he accrued over 30 years of experience. He is a licensed Peace Officer, and worked as the Webb County Jail Commander under the command of Sheriff Martin Cuellar. Judge Jose "Pepe" Salinas is married to Laura Salinas and has five children, Priscilla, Jessica, Kassandra and Kristina and his son, Kevin. 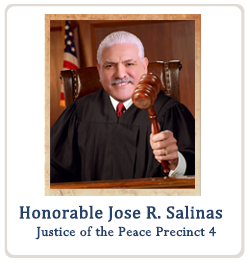 Judge Jose "Pepe" Salinas is dedicated to serve the people of Precinct 4 and supports all residents of Webb County. His experience, coupled with an open door policy and accountability, bringing the best to Webb County.